A super quick and easy way to import our details to your address book. 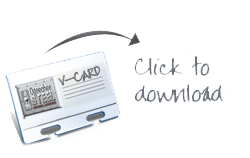 VCards are an electronic business card that can be easily added to your default Address book/Contact Manager. Just click below and open with your default program!